OBJECTIVE(S): LDLT remains underutilized in the US. We compared outcomes between LDLT and DDLT at our center. METHODS: Retrospective review of 226 adult LDLTs vs 632 DDLTs performed 2009-present. RESULTS: LDLT vs DDLT recipients were similar age (55.8 vs 55.8, p=0.99), race, and BMI (28.5 vs 29.5, p=0.12), but differed in donor age (36.6 vs 43.5, p<0.01), c-MELD at transplant (23.3 vs 27.5, p<0.01) and median waiting time (104 vs 146 days). DDLT patients had 2.7 admissions/yr to hospital while on waiting list. 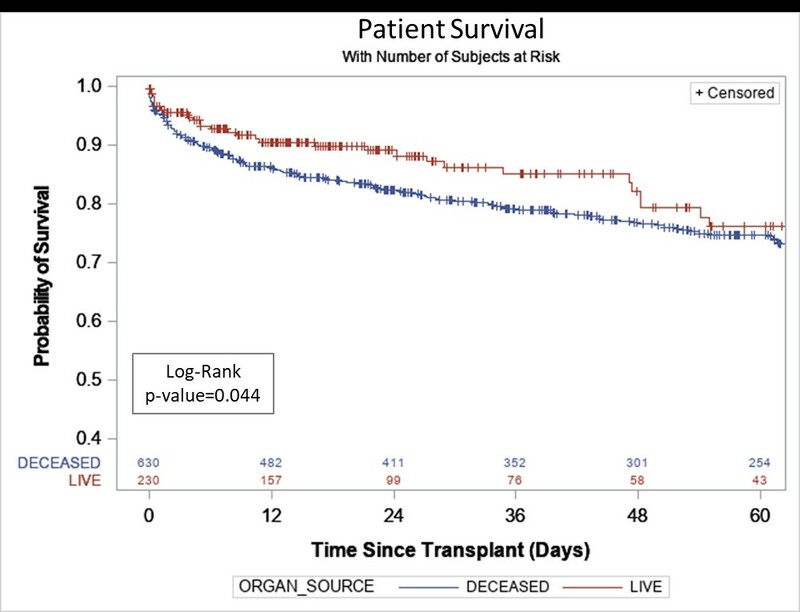 Survival outcomes were superior in LDLT recipients (3-year 86% vs 79%, p=0.04). Other outcomes demonstrated shorter length of hospital stay (11 vs 14 days, p=0.02), less likelihood of intraoperative blood transfusion (52% vs 78%, p<0.01), and less likelihood of posttransplant dialysis. Early reoperation and biliary/vascular complication rates were similar. Hospital costs related to the transplant were 30.8% lower for LDLT (p<0.01). Complications in living donors were acceptable with no early or late deaths, 3-month reoperation rate 3.1%, overall reoperation rate 5.7%, and overall complication rate 20.3%. Given advantages, we have expanded LDLT - in 2017, LDLT comprised 53.6% of our transplants (national average 4.5%), and our transplant rate increased from 44.8 in 2015 to 71.3 in 2017. CONCLUSIONS: LDLT offers advantages over DDLT including superior outcomes and less resource utilization. Time to change the paradigm of how LDLT is utilized in this country.